Alexander is an eccentric 19th century scientist specializing in temporal physics and mechanics. Fueled by the power of desperation, his genius managed to build a perfectly working time machine. This feat alone, which no one ever managed to duplicate in his world, puts him light years before his contemporaries and even future scientists. Whatever creation he makes, he makes it in style; a fine leather chair for his experimental devices to sit in, a lever with a crystalline knob, retractable chairs, electric toothbrushes in the 19th century, etc. etc. In the future, he had to engage in physical combat with the Morlocks, a task he performed with admirable efficiency considering his non-physical background. The machine is an elevated leather chair built into an open mechanical capsule. In front of the chair is a console for operating the machine, including an on switch. On each side the machine, at the front and on the back, there are two propellers, that once the machine is started, generate a time field radiating out from them. By changing the angle of these propellers, which is done automatically once the machine is running, the time field will close itself completely around the time machine into a globe of blue light. The machine is then active and ready for use. The machine itself is very simple in its’ usage; one travels either forward or backwards in time by pulling a lever either forward or backward. The changes to the outside world are visible all the time around the time machine itself during use, and the actual position in time is displayed by a mechanical display showing year, month, date, hour and second, all of which change by rotation of the cylinders onto which the numbers are grafted, as the time travel proceeds. Everything within this globe is then outside the normal continuum of time and cannot be affected, nor seen, by the outside world. However, if something is dropped out from within the active time field, the object or person is immediately aged into total destruction (in DC Heroes, use the APs of Time Travel as an Aging attack; this same attack was used one final time when the machine exploded and eradicated all the existing Morlocks in the world). The traveller stops his trip by resetting the lever to the original position when the desired destination has been reached, upon which the machine soon stops completely. While it wasn’t possible to set the date of arrival this mode of traveling was still practical by just adjusting the lever to travel comfortably to whatever goal one had in mind. He usually chose to travel a few years per second in order to observe the changes in the world around him. However, according to my calculations, the maximum speed was 800 644 years in 82 seconds, which equals ~9 764 years per second of use. That’s an astounding speed! While his machine was therefore only slightly slower than that of, for example, the DC Universe’s Rip Hunter for traveling over very, very large time distances, it probably doesn’t require any Delayed Limitation to his machine’s Time Travel Power (in contrast to, for example, the machine of Horace Hobson). As a final touch, the traveller may comfortably drop a set of retractile stairs down from his chair to reach ground levels to go study the newly reached era. The City Library began using holomatrix guides for its visitors in the near future. The holomatrix is designed as a spirited black male, capable of appearing in any of the mirror-like surfaces in the library. His construction was seemingly made very robust, and capable of functioning, with only little error, throughout the millennia. In highest probability, his power source is nuclear (either fusion or fission-based). The matrix persona was still fully functional through the mirror-like surfaces of the ruins of the city library long after the destruction of the library itself. His programming was sufficient enough to pass for full self-awareness and he seemed to be able to experience the full range of human emotions. The holomatrix persona befriended the time traveller soon after his own creation, a friendship that would endure until they met again many millennia later after the end of mankind’s civilization. The holomatrix persona possesses the full knowledge of the books of the city library and is/was connected to the global information network at his time of creation. His early knowledge would have equated to the full data capacity of the internet on every conceivable subject, and in DC Heroes terms would have been rated at 75 APs in total. As time went by, he probably lost his connection to the world information databases and seems to have lost some of his memory banks due to neglect of maintenance as well. His full database in the future could, in high probability, still reach an impressive total amount of 50 APs of data. The holomatrix persona functions as a friend of the time traveller as well as his informer on various subjects, and is available in any time era from the beginning of the 21st century and beyond. Based on the classic sci-fi novel by H.G. 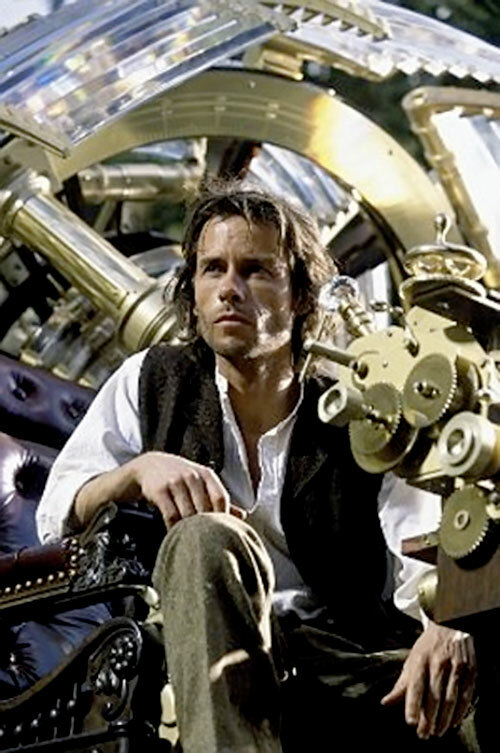 Wells, The Time Machine stars Guy Pearce in the role of scientist and inventor, Alexander Hartdegen, who is determined to prove that time travel is possible. Alexander Hartdegen, 1869-1903, is an American scientist and an associate professor at the Columbia University. He is rumored to be given to eccentric speculation, communicates by mail with Albert Einstein, and is supposed to be working on the creation of his own time machine. His determination is turned to desperation by a personal tragedy, when his great love Emma is killed in a robbery, for which he holds himself responsible, that now drives him to want to change that past. Four years later, esting his theories with a time machine of his own invention, Hartdegen travels back and stops Emma from getting killed. Unfortunately, Emma is soon killed in an accident anyway, and Alexander realizes that he could never save her from her death however many times he would try it. Again, filled with grief, he poses the question of why he can not change the past and travels into the future to search for the answer. His first stop was in the year 2030 at the City Library. He asked a holographic library guide about Time Travel, Practical Applications and posed his question. He received the answer that one cannot change the past since one cannot travel to the past. Unsatisfied with the answer, Alexander continued his travels into the future, but stopped only after some years, in the year 2037. The city was subject to severe destruction and, stopping in that era, found out that it was due to fragments from the moon’s destruction. Fleeing back into his machine, he activated it, starting the trip forward in time, but fell unconscious from the tremors his machine was subject to. After a long journey through time, Alexander temporarily regained consciousness and turned off the machine. When next he woke up, he was taken care of by the Eloi, the next evolutionary step of humans. He had arrived 800,000 years into the future, to the year 802,701. At this time, civilization was all gone and mankind had evolved into two separate species; the subterranean hunters, the Morlocks and the hunted, the Eloi. 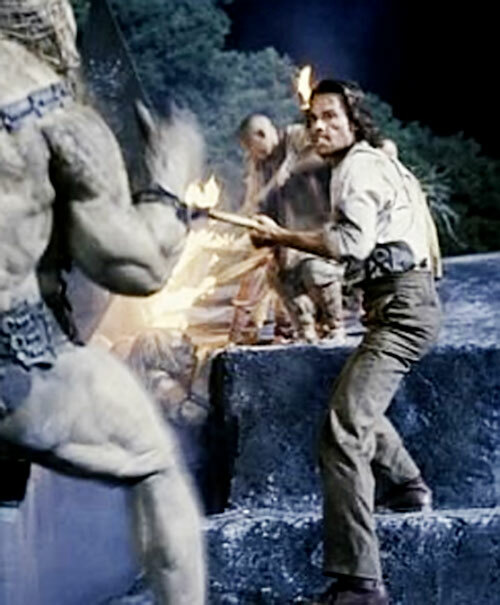 After being attacked by the Morlocks, Alexander decides to help the Eloi survive and to stop the threat of the predatorial Morlocks. 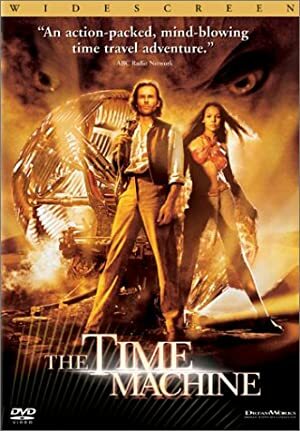 In the final fight, where Alexander helps a woman he’s befriended, after having defeated the telepathic leader of the local Morlocks by dropping him outside the active time field of his machine, he programs his machine for self-destruction in a time wave that destroys all the Morlocks, through all their subterranean societies. He had forever changed the future history, but remained trapped in that future era. He had, however, found peace within himself after saving the Eloi and considered himself to be at home there. Alexander is a man of slender built clad in a fine 19th century suit, complete with black shoes, a white shirt and a small tie. The suit comes complete with a pocket watch with a picture of Emma in it. His hair is back combed and black and his eyes are brown. This gives an impression of classic elegance that women tend to like. His body language is non-offensive and curious. The professor is a scientifically curious man with a pioneering spirit. For example, he built an electronic toothbrush in the 19th century. His peers consider him somewhat eccentric. He believes in the possibility of time travel and intends to prove its’ existence to the world. His best friend is Philby and his great love was Emma. Although he always loved his work, and was very absent-minded, he fanatically buried himself into it in order to bury his sorrows after Emma’s death. His curiosity in time travel turned into guilt and desperation after her death, since it offered him a chance to change history by travelling back in time and hindering her death. Having delved too much in his scientific calculations and mechanical work, he has lost some of his social skills. He tends to appear rather incompetent when handling his emotions with women. Otherwise, he has a pretty common 19th century mentality. He is also a perfectionist, which is evident in his creations and manners. In the future, he couldn’t accept that the Eloi were hunted and killed by the Morlocks. He was willing to die in order to protect and save them all. In fact, he was reckless, with no consideration for his own safety, just like he had been when he tried to protect Emma so many years ago. This sort of natural bravery seems to be an important part of him. In the end, when he finally did so, he found himself a place in the world and found peace within himself. It appears as if Alexander was the only time traveller in his world ever. In the DC Universe he would have been the first time-traveller. Perhaps Emma’s surname was Hunter, and she was the grandgrandmother of Rip Hunter, who found Alexander’s notes many years into the future. Or Alexander is simply from a parallel universe, and ends up in the DC Universe whenever he tries to change history. Considering his scientific genius, he could be a candidate for membership with the Linear Men. If he were a part of the DC Universe the final time where he ended up meeting the Morlocks and the like could have been the age of pre-Crisis Kamandi (somewhere around 2040-2100). Kamandi’s world includes savage humans and intelligent animals, just like in the professor’s own distant future. He would surely befriend Kamandi and his android friends, trying to better the future of mankind.